Our organically crafted Jasmine Body Butter is a premium quality, exquisite floral body butter obtained by the extraction of the night-blooming Jasmine flower petals (Jasminum grandiflorum) into our proprietary exotic butter base to produces a truly lavish and skin nourishing body butter with an intoxicating deep floral aroma and a beautiful soft off-white colour. 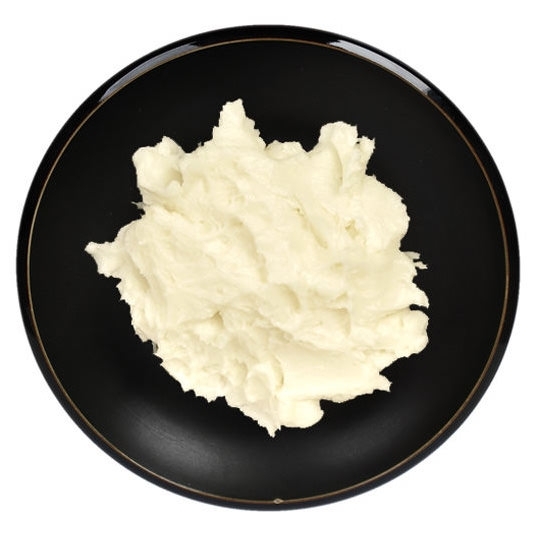 With this exotic butter we get the skin nourishing and aromatherapeutic properties of the Jasmine flowers in a luxurious, easy to use butter base that will add amazing skin feel to any emulsion, or anhydrous formulation. Jasmine Butter is highly suitable for treating skin conditions such as eczema as it can moisturize and detoxify the skin. It also works well as a treatment for dry, cracked heels as it can penetrate deep into the skin layer and regenerate skin cell production, nourishing your epidermis from the inside. It can also help relieve scarring on the skin associated with healing wounds, stretchmarks and acne as it has powerful cicatrisant properties. Jasmine Butter is a natural aphrodisiac and can increase sensuality and promote libido. Jasmine Butter also exhibits a calming effect that can act as a natural sedative and help one sleep better. Jasmine Butter can also help relieve the pain associated with menstrual cramps due to its potent natural analgesic qualities. It can also help balance hormone levels during menopause and get relief from menopausal symptoms.